There are two main categories of reverb. There is algorithmic reverb which uses a self contained step by step set of rules to create a reverb and there is that type I am going to look at in this article, convolution reverb. A simple way of thinking of it is that an algorithmic reverb is programmed from the ground up and a convolution is sampled from a real acoustic space, and I think you can already see where this is heading. I don’t know about you but one of the most difficult things I find about using any reverb plug-in is choosing the type of reverb to use. Do I want a plate or a hall or a chamber or a room reverb for my next chart topping release? I’ll often just dive for one of the plug-ins I used last time around and go to the same plate or hall setting. I’m not what you might call reverb curious. 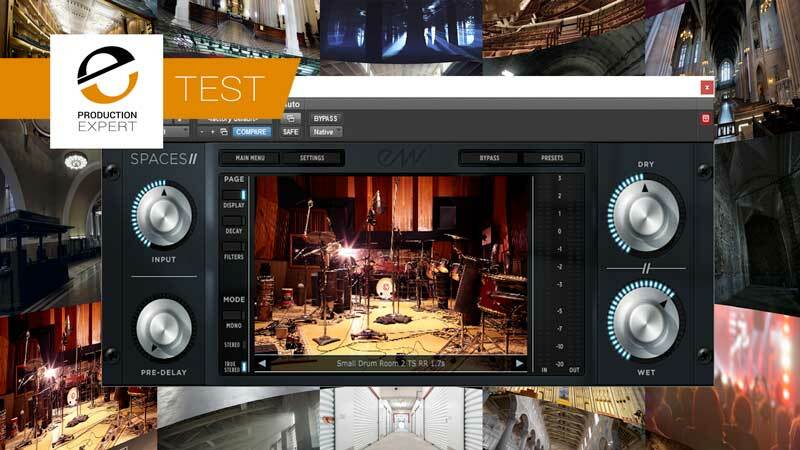 However, I’ve had a bit of a reverb enlightenment since using the new EastWest Spaces II reverb, and the enlightenment came when I discovered that some of the convolutions for this plug-in have been taken from some of the best sounding recording spaces in the world, mainly EastWest’s own studios in Hollywood California. Not just random concert halls that I have never been to in far off places but rooms that I have heard in countless records. Reverb sounds that I know and like. No, I’m not going to start talking about deodorant from mid 80’s (one for the brits there) but the impulse or rather the captured impulse response is what drives a convolution reverb. The impulse is created by a starting pistol or some other short sharp sound in the room to be captured. This is then recorded by a microphone or array or mics for later processing and conversion into the reverb convolution. Spaces II picks up where Spaces (I) left off. There are now around 1020 presets to sort through using the very simple Presets browser. The presets have been categorised into different space type including halls, rooms, studios etc, which you would expect but also instrumental sections. This is a unique feature to Spaces II. If I select a patch that is given a room name then Brass, this means the impulse was taken from the part of the stage, or performance area where you would expect to find the brass section. This means you can build up your orchestra giving each section the same room type with the appropriate reverb position, so strings get a string reverb, woodwind gets a woodwind reverb and so on. In this way you get the most accurate stereo picture from both the direct sound and the reverb. This would be very useful when using, oh I don’t know, some of the EastWest orchestral sample libraries perhaps? In the video below you get to hear how I use EastWest Spaces II on three recent projects. I show you around the GUI and then let you hear how I used the plug-in to put the instruments and voices in a real, yet fake, acoustic space. I think I last used a convolution reverb plug-in about 4 years ago. I became disillusioned with not getting the sounds I wanted from plug-ins “rooms” in which I had performed in real life. A good convolution reverb is supposed to make you feel like you are there, thats the point. Spaces II sounds amazing. The rooms/spaces sound great and the is plenty sonic detail to keep a stereo image nice and clean. The quality of any reverb is in the tail and the way the reverb fades into silence and you only have to listen to Spaces II to be more than happy with the reverb tails of these stunning room sounds. To my ears Spaces II is one of the best sounding convolution reverbs I have heard and used and if you like the idea of putting your productions be it music or post in some very authentic sounding acoustic environments, you should check out EastWest Spaces II, you will be very glad you did.